This interesting name is of Anglo-Saxon origin, and may be either a locational or a topographical surname. As a locational name, Hailey derives from either one of the places so called, in Hertfordshire, near Hoddesdon, or in Oxfordshire, near Witney. The place in Hertfordshire is recorded in the Domesday Book of 1086 as 'Hailet', and as 'Heyle' in 1374, while the place in Oxfordshire is listed in the Hundred Rolls of the county, of 1275, as 'Hayle'. Both places share the same meaning and derivation, which is 'the hay clearing', from the Old English pre 7th Century 'heg', hay with 'leah', clearing, glade. 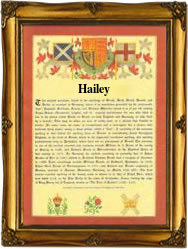 As a topographical name, Hailey and its variant forms Hayley, Haily and Haly denote residence by such a 'hay clearing'. The surname development includes Roger de Hayleye (1328, Gloucestershire) and Thomas Haley (1420, Nottinghamshire). Margrit Hailey was christened at Thame, Oxfordshire, on September 1st 1613. The first recorded spelling of the family name is shown to be that of William de Hayleg, which was dated 1251 - 1252, The Warwickshire Feet of Fines, during the reign of King Henry 111, 'The Frenchman', 1216 - 1272. Surnames became necessary when governments introduced personal taxation. In England this was known as Poll Tax. Throughout the centuries, surnames in every country have continued to "develop" often leading to astonishing variants of the original spelling.